I will be getting caught up with the all-star game recaps this morning, so bear with me as I get them posted. The first camp all-star game featured some of the younger drafted players by the Stars, and also a number of non-drafted "free agents" who impressed the coaches during the prior camp games. This game consisted of three, 20 minute periods (running clock). 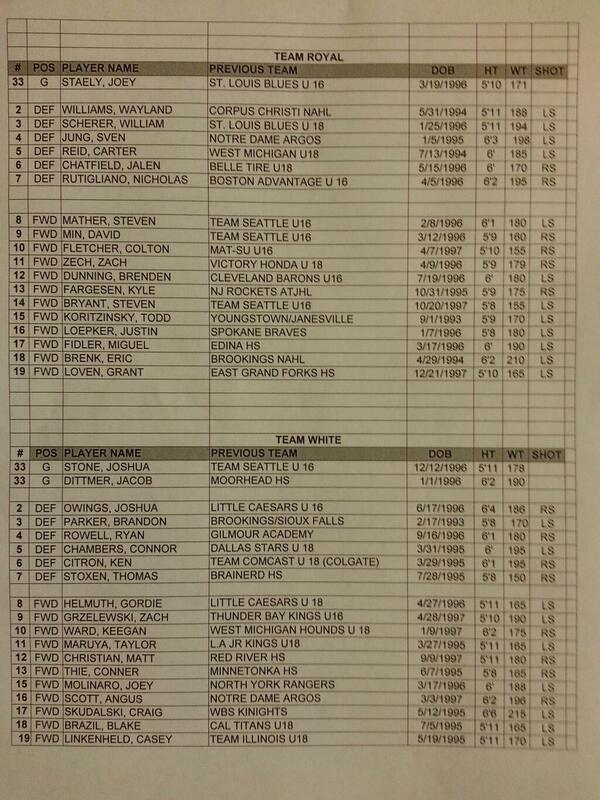 Click here to view the roster sheet from the first all-star game. The Royal squad had one goaltender, six defensemen, and 12 forwards. The White squad had two goaltenders, six defenseman, and 11 forwards. The three goaltenders who participated in this game each played two periods. Jacob Dittmer played one period for Team Royal, and one period for Team White. The other two goaltenders played two periods for their respective teams. Six players who started this first all-star game were pulled out early so that they could prepare for the second all-star game. Those players were: Wayland Williams (D), William Scherer (D), Kyle Fargesen (F), Eric Brenk (F), Connor Chambers (D), and Ken Citron (D). Both teams came out very strong and played to a scoreless tie at the first intermission. Goaltender Jacob Dittmer played the first period for Team White and did not give up any goals. Netminder Joey Staely started the first period for Team Royal and also did not give up any goals. In the second period, Team White outscored Team Royal 2-1. White opening the scoring in the second period with a goal from forward Matt Christian, with an assist going to defenseman Ryan Rowell. Rowell worked hard to keep the puck from exiting the offensive zone, and fired a shot on goal that was deflected by Christian and into the back of the net past goaltender Joey Staely. Royal knotted the game up at 1-1 when defenseman William Scherer wristed the puck past White goaltender Joshua Stone from the slot area just in front of the net. White finished out the scoring in the middle stanza with a goal from defenseman Connor Chambers. Unfortunately, I did not get a good look at this goal so I did not see how it developed. In the third period, White outscored Royal 2-1 again to wrap up a 4-2 victory in the first camp all-star game. Royal knotted the game up at 2-2 with a goal from forward Miguel Fidler. White answered right back to take 3-2 lead with another goal from defenseman Connor Chambers. The eventual game-winning goal for White came on an odd-man rush with a nice assist going to forward Conner Thie. Royal put a lot of pressure on White at the end of the third to tie the game, but they could not get a puck past Joshua Stone. Conner Thie wrapped put the nail in the coffin with an empty-net goal with less than one minute remaining to seal the victory for Team White. White goaltender Joshua Stone played the second and third periods for Team White and gave up two goals. Jacob Dittmer started the first period for White, and the third period for Royal and gave up only one goal. Joey Staely started the first and second periods for Royal and gave up two goals. For these two all-star games, I'm not going list certain players who impressed me because they all looked great. These players wouldn't have been selected for the all-star games if they hadn't had a great camp. I will, however, name a MVP from each team. My MVP of Team White goes to a pretty obvious choice, defenseman Connor Chambers. I think Chambers really opened some eyes yesterday with his two goals, and his one goal later in the second camp all-star game. For an undrafted, free agent, Chambers had a very good camp. For Team Royal, I'm also going to give some love to a defenseman, this time it's Nicholas Rutigliano. This kid has great size (6'2", 195 pounds) for a '96, and plays a quiet, but solid shutdown role. I hope this is a player the Stars can bring to Lincoln this year, or next. Great first all-star game! Congrats to all of the players who made it this far. It was fun to watch you all participate at camp. Best of luck going forward!